The event is open from 10am-5pm on both days and entry is just £3.00 which includes the Walled Garden itself. Norfolk Log Planters – Handmade garden planters and other garden products made from logs and recycled telegraph poles. The Farmer and The Florist – A variety of plants and cut flowers. Barcham Trees – A selection of trees, books and sundries. Palmer’s Nursery – Ornamental grasses and bamboos. Helen’s Herbaceous – Plants for the cutting garden. Newleaf Woodcraft – Woodcraft, garden boxes, plant labels, spring holders, birdtables, tea-light holders, lamps and doorstops. Garden iron work and other unique items. 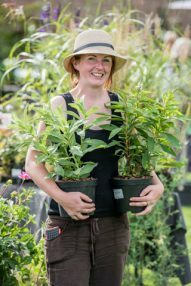 Helen’s 4 Seasons Plants – Winter interest shrubs with sub shrubs and herbaceous perennials for year-round interest. Walnut Tree Garden Nursery – Hardy herbaceous perennials, shurbs and trees. Riverside Bulbs – Autumn planting flowers and bulbs such as Tulips and Narcissus. Predator Plants – Carnivorous plants and related products. Creake Plant Centre – Shrubs, herbaceous plants, climbers and bulbs. Panache Plants – A range of exotic and unusual plants including herbaceous, tropical, cacti and air plants. The Norfolk Olive Tree Company – Olive trees, grapevines, fig trees and pomegranate trees.